While it is true to say, “not all heroes wear capes,” we can certainly say that Stan Lee wore them all. As the father of Marvel Comics and the creator of many superheroes we know and love, he breathed life into a universe that we all never knew we needed. Even though he died on Nov. 12, 2018 at the age of 95, the legacy he left will never be forgotten. On Dec. 28, 1922 Stanley Lieber was born, and his story began. His parents, Jack and Celia Lieber, were Jewish immigrants from Romania. They lived in New York City, and there, Stanley Martin Lieber began his legacy. He graduated from high school at just 16, and got a job at Timely Comics soon after. He started out filling inkwells and erasing the stray pencil marks of other writers, In 1942 he was promoted to editor. In that time he had begun to write comic-book scripts for Timely under the pen name, Stan Lee. He eventually changed his name legally to Stan Lee. With every great name comes a great catchphrase. In the '60s Stan Lee wrote a monthly column in Marvel's Bullpen Bulletins newsletter. At the end of every column was the catchphrase, "Excelsior!" As the world of Marvel evolved, Stan Lee created many characters and worlds within worlds. Many of the characters developed into teams such as the Fantastic Four, the Avengers and the X Men, teams that you may recognize from recent movies and TV shows. The Fantastic Four is described as the first Marvel family. Lee created this group with artist Jack Kirby in 1961. According to their back story, a group of people were exposed to cosmic rays during a scientific mission to outer space, and after, they gained superhero abilities. They didn’t fall under the stereotype as normal superheros. They often had problems we humans can relate to. Even though this “family” is a bit dysfunctional at times, they all are very close. Ever been bitten by a radioactive spider? Well Peter Parker, an avid science admirer, was. But be careful, not everyone develops arachnid powers. Spiderman was created just a year later in 1962 with the help of artist Steve Ditko. The idea behind Spiderman was to create a hero that people could find relatable. Don’t you just hate it when you are exposed to gamma rays during the detonation of an experimental bomb and turn into a green monster that yells “Hulk smash!” ? Maybe an even more relatable character created was the Hulk/Bruce Banner. Bruce Banner was a physically weak, but strong-minded scientist. Just be careful you don’t put him under emotional stress, or compare him to the Jolly Green Giant; you might be surprised when a much more aggressive green giant smashes the can of green beans on your head. Red hair counts as being a mutant right? So that basically means it counts as having the X gene? Being a Mutant in this case is referring to the subspecies of humans who were born with superhuman abilities thanks to the X Gene. Originally, there were the X Men who are led by Charles Xavier (also known as Professor X). Lee created them in 1963 with the help of Jack Kirby. Of course there is more to Stan Lee than just his magnificent comic book creations. He served in the Army in 1942 in the training film division. He wrote training films, film scripts, posters, and instructional manuals. Working with him was (not one fish, or even two fish, maybe a blue fish), but Dr. Seuss!, aka Theodor Seuss Geisel. Lee married Joan Lee and together they had two daughters, Joan Celia ( JC ) and Jan Lee. 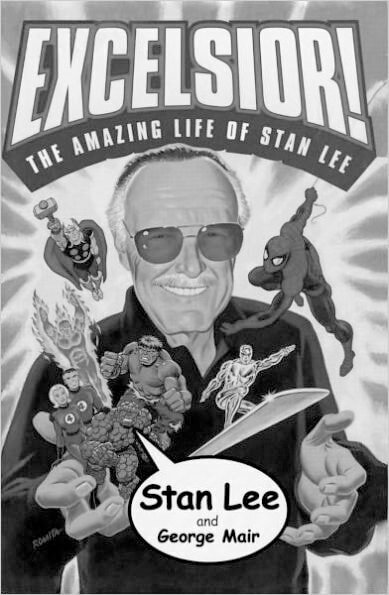 He wrote an autobigraphy “Excelsior! The Amazing Life of Stan Lee” and he even had his own show, Stan Lee’s Superhumans. No super-hero fan will ever forget the day our hero passed ( darn you Thanos! ). Stan Lee will forever be an inspiration to many, and a father of all the stories we hold close to our hearts. It is now up to us to keep this planet entertained with imagination and creativity. Excelsior!